Have you heard of Rett syndrome? If you haven’t, this is a great time to learn about it. The non-profit International Rett Syndrome Foundation is working to get governors in all 50 states to sign proclamations designating October as Rett Syndrome Awareness Month. Education and increased awareness is essential to improve the lives of children affected by this rare neurological disorder, which almost exclusively occurs in girls, according to the Foundation’s website, Rettsyndrome.org. In honor of Rett Syndrome Awareness Month, here are the answers to three essential questions about the condition. 1. What causes Rett syndrome? This progressive neurodevelopmental disorder typically results from mutations of the MECP2 gene on the X chromosome, according to the National Organization for Rare Disorders (NORD). In 99 percent of cases, the mutations are sporadic and aren’t inherited from the child’s parents. The disorder usually occurs in girls because of its link to the X chromosome. Since males have only one X chromosome, any X-linked disorders will be fully expressed, NORD states. As a result, most cases of MECP2 gene mutation in boys lead to miscarriage or stillbirth. 2. What are the symptoms? 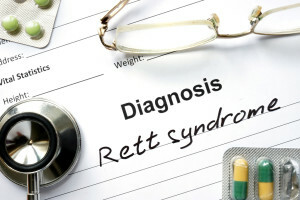 The way Rett syndrome presents – including the severity of symptoms as well as when they start – varies from child to child, according to the National Institute of Neurological Disorders and Stroke (NINDS). In general, however, children with the disorder will grow and develop normally early on, although symptoms such as loss of muscle tone and jerky movements might appear even in early infancy. Rett syndrome typically occurs in the following four stages, according to NINDs. Stage I (begins between 6 and 18 months of age): Also known as early onset, symptoms in this stage can include decreased eye contact, less interest in toys, gross motor skill delays, decreasing head growth, and hand-wringing. Stage II (between ages 1 and 4): During stage II, or the rapid destructive phase, the child will usually display symptoms such as loss of spoken language. Additionally, she will display hand movements like wringing, washing, clapping, tapping, and/or repeatedly bringing her hands to her mouth. Other signs include slowed head growth, unsteady walking, loss of social interaction and communication capabilities, and breathing problems (e.g., sleep apnea). Stage III (between ages 2 and 10): As a child enters the plateau/pseudo-stationary stage, she will likely experience apraxia, seizures, and motor problems. Still, she might show improved, less irritable behavior. This stage can go on for years, and many girls stay in it for most of their lives, NINDS states. Stage IV: This stage, known as the late motor deterioration stage, involves scoliosis, muscle weakness, rigidity, and reduced mobility, among other symptoms. At this stage, which can last for decades, previously mobile girls might stop walking. However, they usually won’t experience deterioration in hand skills, communication, or cognition during this stage. 3. If my child has Rett syndrome, what are the treatment options available? Treatment for Rett syndrome will focus on your child’s specific symptoms, and it might involve a team of specialists, according to NORD. Pediatric neurologists, speech therapists, psychiatrists, pediatricians, and other healthcare providers can join forces to come up with the right treatment plan. For information about how pediatric therapy services can help children with Rett syndrome and other disorders, don’t hesitate to contact our team of professional pediatric therapists. We deliver comprehensive and educational care to change the lives of children one step at a time. To learn more, call 847-707-6744 or email info@littlestepspt.com.